Born October 6, 1842, near Murfreesboro, Tenn. Educated at the Western Military Institute at Nashville. Company 1, First Tennessee Regiment. In 1863 he was assigned to Shaw’s Scouts, Cheatham’s Division. Davis was captured in his native state, then within the Federal lines. were found upon his person. who had also been captured and was confined in the same prison. condemned to death and executed at Pulaski, November 27. Location. 36° 9.906′ N, 86° 47.054′ W. Marker is in Nashville, Tennessee, in Davidson County. Marker is on Dr. Martin Luther King, Jr. Boulevard east of 7th Avenue North, on the right when traveling west. Touch for map. 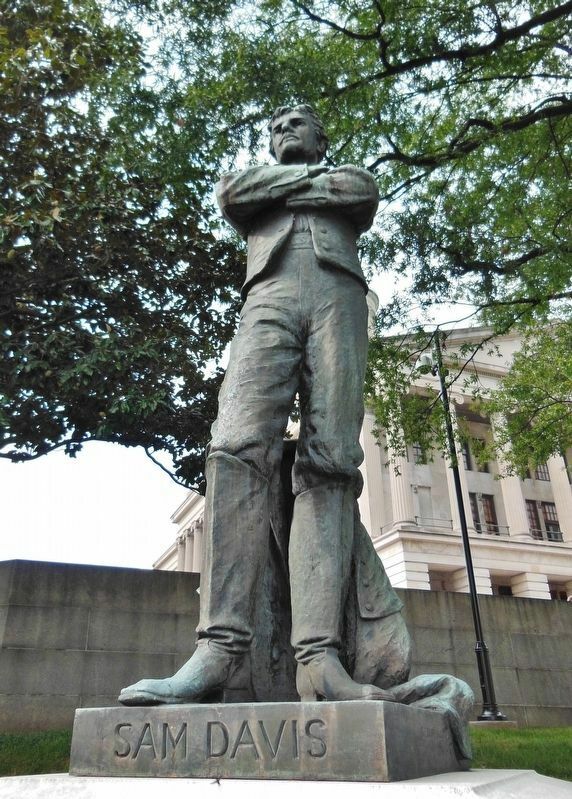 Marker, monument and statue are located near the southwest corner of the Tennessee State Capitol grounds. Marker is at or near this postal address: 600 Charlotte Avenue, Nashville TN 37219, United States of America. Touch for directions. Other nearby markers. At least 8 other markers are within walking distance of this marker. 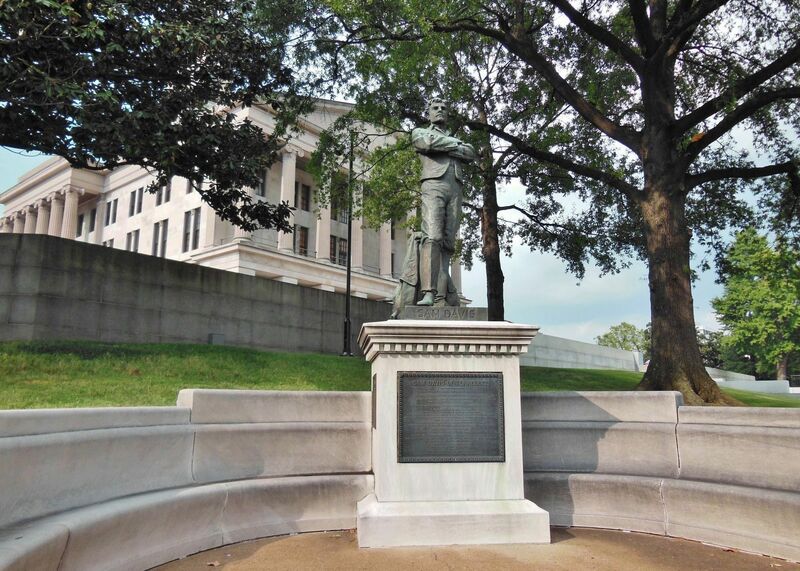 Lest We Forget: The Middle Passage (a few steps from this marker); Tennessee State Capitol (within shouting distance of this marker); Andrew Johnson (about 400 feet away, measured in a direct line); Alvin C. York (about 400 feet away); Founding of the United Daughters of the Confederacy (about 400 feet away); Andrew Jackson (about 500 feet away); Nashville Sit-Ins (about 500 feet away); Holy Rosary Cathedral (about 500 feet away). Touch for a list and map of all markers in Nashville. Also see . 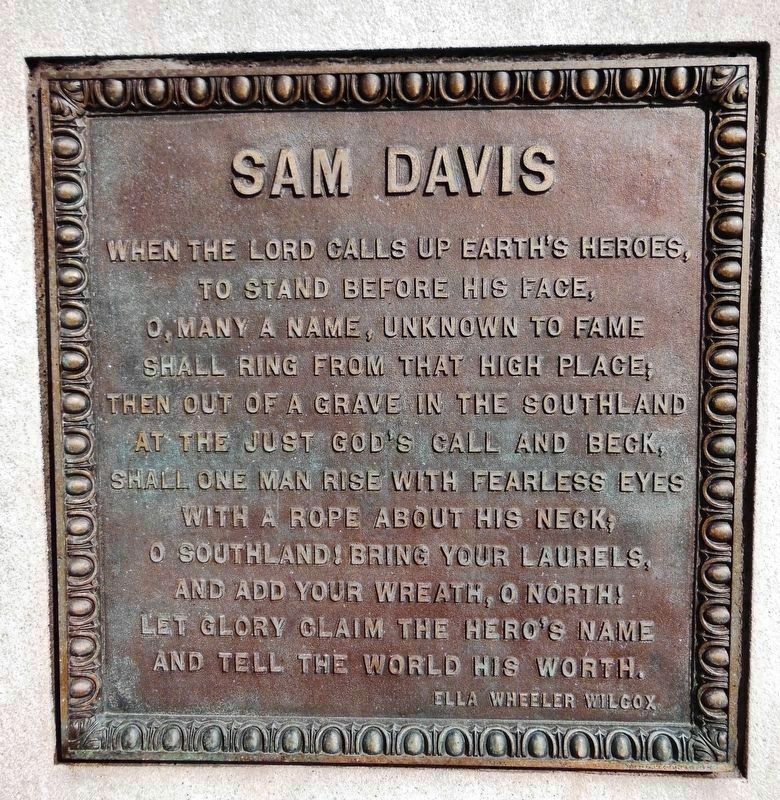 . . Sam Davis (Wikipedia). 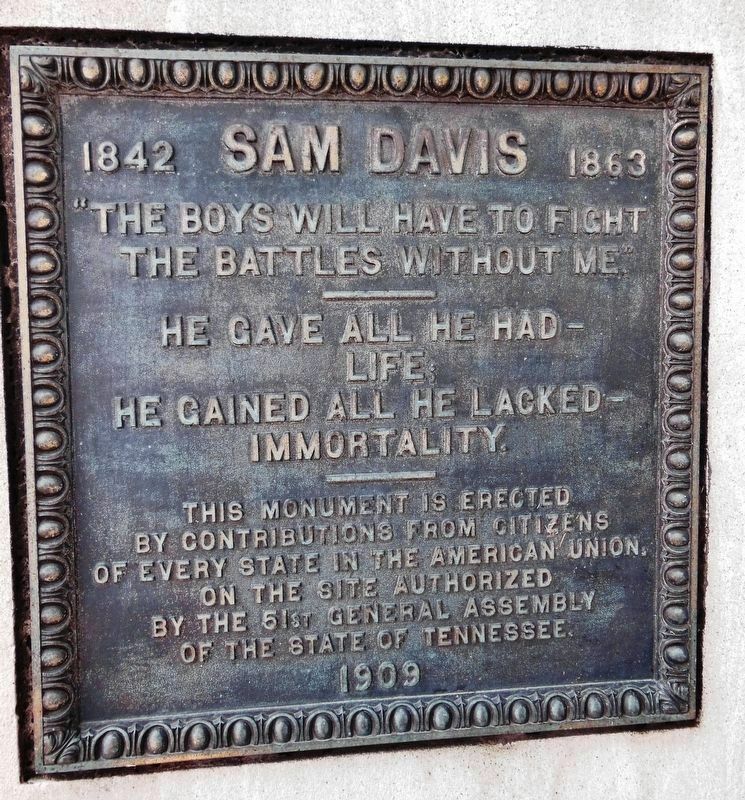 Davis suffered a fate shared by many intelligence gatherers operating around Nashville. Most of the rural counties surrounding Nashville were only nominally under Union control, and this 'no-man's land' witnessed over three years of bloody internecine conflict and the steady dissolution of the institution of slavery. he gained all he lacked – immortality. of every state in the American Union. and add your wreath, O North! and tell the World his worth. More. 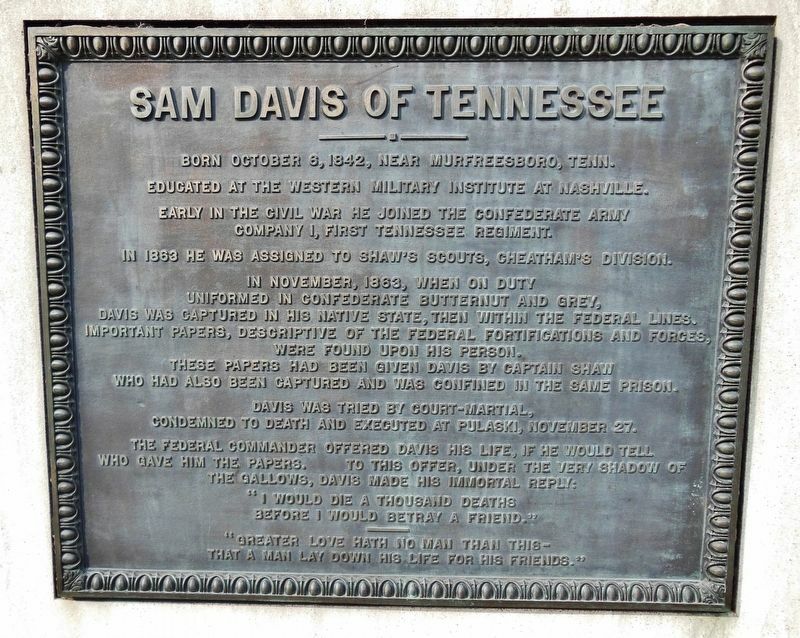 Search the internet for Sam Davis of Tennessee. Credits. This page was last revised on March 19, 2019. This page originally submitted on March 19, 2019, by Cosmos Mariner of Cape Canaveral, Florida. This page has been viewed 51 times since then. Photos: 1, 2, 3, 4, 5. submitted on March 19, 2019, by Cosmos Mariner of Cape Canaveral, Florida.